Matthew Mullins, Chicoma, Acrylic Ink and Watercolor, 58" x 38"
From intimate works on paper to large-scale canvases, the bulk of Matthew Mullins’ work begins with layers upon layers of acrylic ink and watercolor that form a realistic under painting of a natural environment. 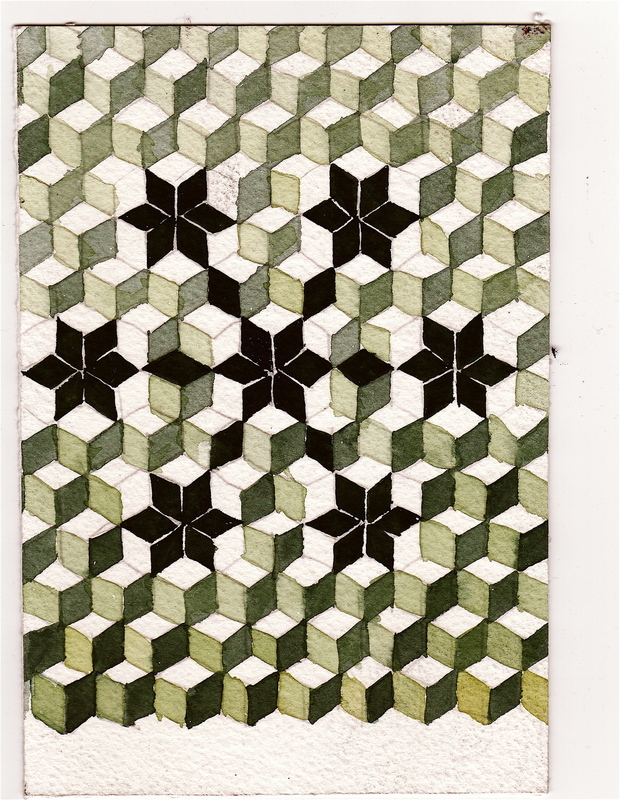 The artist then begins to obscure the image with a human made pattern, maybe found from a folk tradition or a tiling manual, allowing the two elements to intersect and mingle on the paper or canvas in an intuitive way. A mystical grove of pine trees, a serene lake, or a majestic mountain landscape is imbued with a construct that has been filtered by mankind. The result doesn’t create clash or controversy; it realizes harmony as a visualization of the unified web to which we all belong. Matthew Mullins, Pines (Blue), Acrylic on Canvas over Panel, 16" x 12"
Matthew Mullins, Ridgeline, Watercolor on Paper, 60" x 40"
This process allows for risk taking and ambiguous experimentation, an exciting prospect for the artist. The permanence of the medium stimulates Mullins as he progresses through a piece, obscuring parts that could have taken hours to complete. As the acrylic ink immediately stains the paper, Mullins is inspired by the sense of risk in that moment. The piece continues to build and shift with each layer of ink, and is finished with watercolor to soften the hard edges of the acrylic. 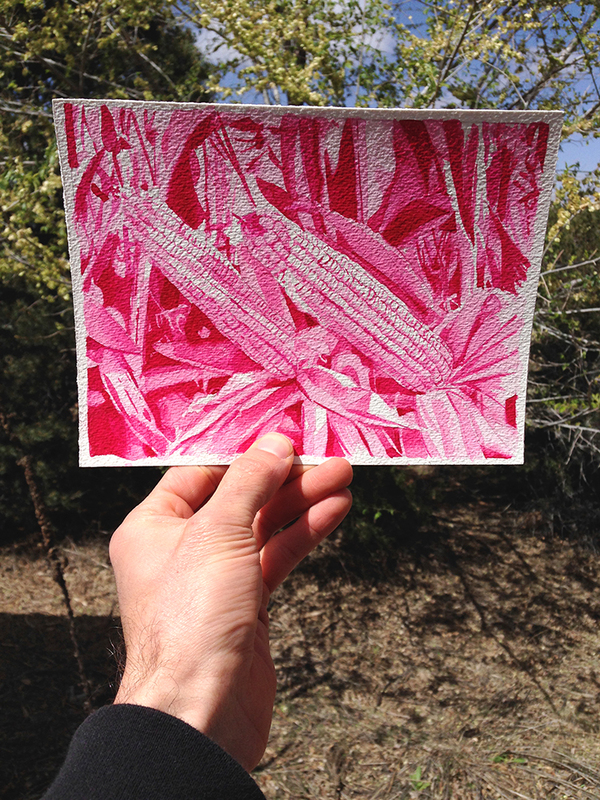 See this process embodied in Chicoma, Aspen & Pine, Nebula, and Annie, among others. Matthew Mullins, Chicoma, Acrylic Ink and Watercolor on Paper, 58" x 38"
Mullins dives deeper into the literal connection between humans and nature with a series of mandala pieces called The Creation of the Elements. These cosmic watercolors take us out of our typical earthly view and into an environment similar to the one in which we were created. The starry sky imagery recalls the origins of our universe and subsequent formation of stars through hydrogen gases and cosmic dust. Many of the elements in our own physical bodies were created in this process; as a testament to this, Mullins finishes each piece in the series with a resonating artifact such as a drop of blood, or a small piece of copper, paying homage to the original integration of natural forces and our physical selves. Matthew Mullins, The Creation of the Elements: Copper, Watercolor and Copper on Paper, 24" x 24"
Mullins also experiments with collage, drawing inspiration from crazy quilts, and has a traditional landscape watercolor series. He began these works on paper as a way to deepen his skillset for painting the natural scenes in his patterned work. To learn more about Mullins’ process and life in the studio, follow his Studio page and connect with him on Instagram and Facebook. 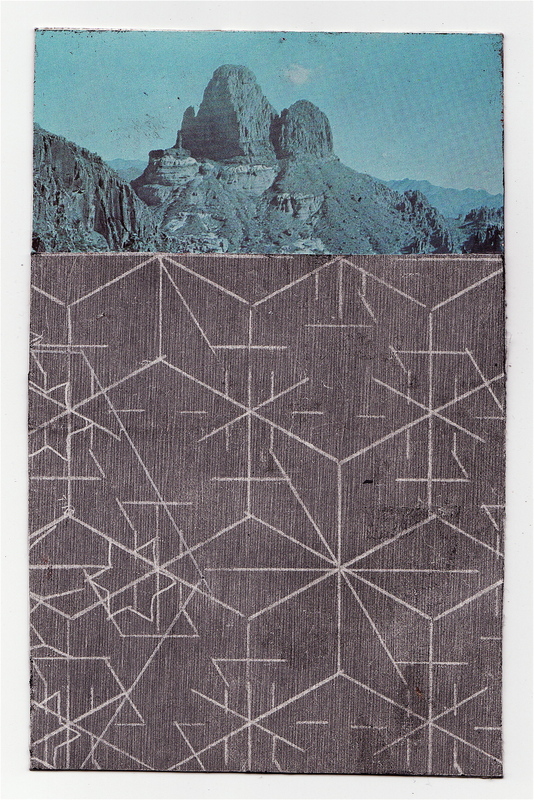 You can also see his finished work on display at Form & Concept in Santa Fe, New Mexico. Matthew Mullins, Grizzly Peak, Berkeley, Graphite Drawing, 19th Century Lithograph, Watercolor and Acrylic on Paper, 20" x 16"
I recently visited the 1000 year old ruins at Chaco Canyon, in a remote area in Northwestern New Mexico. To get to the ruins you drive about 20 miles down a dirt road, under an expansive sky with faraway horizons punctuated by mesas. I saw a group of horses that may have been wild as I was nearing the ruins. 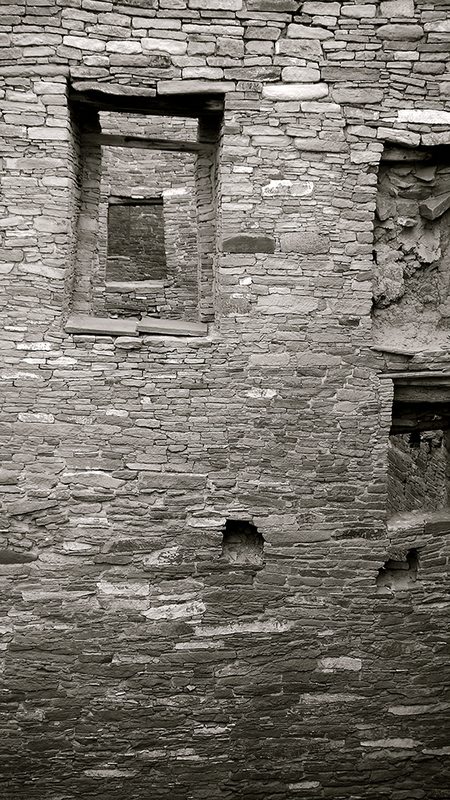 Chaco Canyon has the densest concentration of ruins in the American Southwest and is among the best examples of ancient Puebloan architecture. It is also among the least understood. This is a very special place. The stillness, being alone in such a desolate location and being one of only two people in the entire canyon created a sense of solitude and timelessness. But, I was also overcome with a sense of presence and human life. Walking and standing amongst the millions of stones laid down by human hands over a thousand years ago was much like standing in front of brushstrokes in a painting made long ago. I could sense the makers of these impressive structures by contemplating the labor and decision making involved in the placement of each individual stone, much like one can sense a bygone painter by standing in front of a painting (where they stood while making it) and contemplating the individual brushstrokes and decisions that comprise the painting. It is a way to connect with the spirit of human life, but from a different time and place. 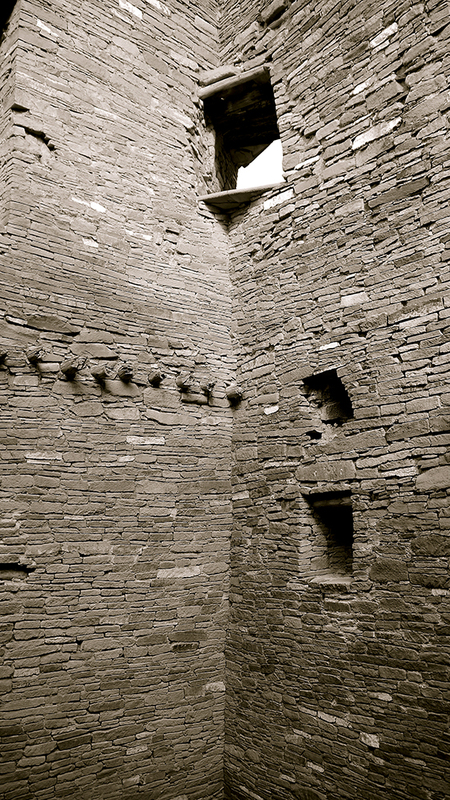 The builders of Chaco Canyon are known for their advanced knowledge of astronomy and aligned many of the structures at Chaco Canyon with celestial events. Best known is the Sun Dagger, a grouping of petroglyphs that track both solar and lunar cycles. Other petroglyphs at Chaco Canyon depict the Supernova of 1054. Being there creates a broader sense of time than one has in day to day life. Out there, it feels like millennia can go by like minutes.